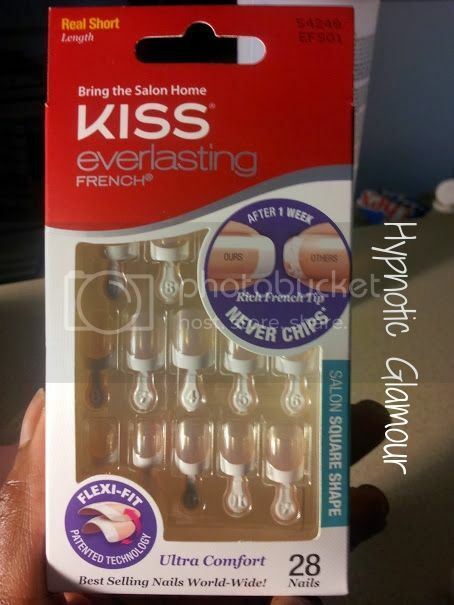 Hypnotic Glamour Beauty Blog: KISS Everlasting French Nails. How To Make Your Nails Last At Least 1 Week. KISS Everlasting French Nails. How To Make Your Nails Last At Least 1 Week. I decided to dry these nails again. This time I was able to get a whole seven days (and counting) out of them. How? Well keep reading to find out. There are a few things that I did differently this time. "Roughed up" the surface of my nail. Very gently, I took the less coarse side of a nail file and ever so lightly removed the shine from my natural nail. Put the glue on the artificial nail only. I only put glue on the KISS nail, never mine. But that's it. These simple things have allowed me to keep these nails on for the past seven days. I plan on going to 14 with these.